Since the introduction of the IBM® Workplace™ strategy, many Lotus® Notes® and Domino® clients have been wanting to better understand how the release of IBM Workplace software products would impact their existing investment in Lotus Domino. While many in the Notes/Domino community have shown interest in the IBM Workplace family of products based on Java™Platform, Enterprise Edition (J2EE) and open standards, others have expressed concern about the implications for the future of Domino. The key message of this book is that IBM Workplace products extend and enhance the value of your investment in Domino. 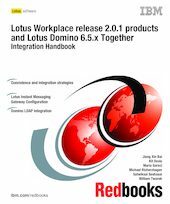 Release 2.0.1 of Lotus Workplace products (predecessors of IBM Workplace Collaboration Services) and Lotus Notes/Domino 6.5x offer features designed to help you integrate Lotus Workplace products into an existing Notes/Domino environment. This allows you to offer your users a choice of tools most suited to their specific needs, while protecting and leveraging your on-going investment in Lotus Notes/Domino. - Interoperability points available in Lotus QuickPlace® —in the 6.5.1 release, in the 7.0 release and in the future. Where appropriate, this book describes specific real world scenarios, illustrating how a combination of technologies can solve the problem. It details the technical implementation of the scenarios so that readers can actually duplicate the solution.